For most people, the word “robot” conjures up the image of a lumbering metallic machine. Now, researchers report that they can fabricate robots with the exact opposite features—soft, pliant, and mobile—using 3-D printing. Today in Science, researchers at the Paulson School of Engineering and Applied Sciences and the Wyss Institute for Biologically Inspired Engineering announce a new technique to manufacture soft-bodied robots with far greater mobility than previous iterations. Compared to their traditional counterparts, soft robots are better adapted to unstructured environments, more capable of squeezing into tight spaces, and safer for use in interactions with humans. They do have some rigid parts, such as batteries and pumps, because current technology is not yet capable of manufacturing such components from soft materials, notes Robert Wood, Charles River professor of engineering and applied sciences, the paper’s senior author, who is best known for creating a microrobotic fly. The key challenge in manufacturing soft robots is to effect a gradual, rather than abrupt, transition between the robot’s soft and rigid parts, because an abrupt interface can result in mechanical failure. 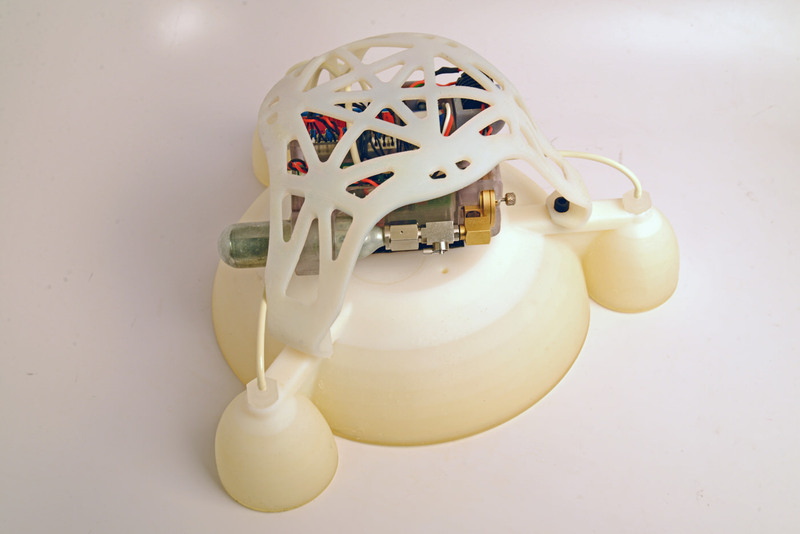 The researchers were able to engineer this gradual transition in a newly designed robot that weighs less than two pounds, using materials whose rigidity ranges from the softness of human skin to the hardness of plastics. Its motions are powered by the combustion of butane and oxygen inside its body; this allows for dramatic movements, such as jumping two and a half feet high (six times its body height). The new soft robot could prove useful in the exploration of hazardous environments, as in the aftermath of a disaster, Bartlett said. The jumping motion allows the robot to hurdle barriers such as fallen trees and rocks, and its flexible lower surface enables the navigation of uneven surfaces, which often present difficulties for traditional robots. Another potential use is in space exploration: soft robots would have little trouble with the rough terrain and debris on the surfaces of the moon and Mars, according to Bartlett, while the lower gravity on these planets makes its jumping motion more efficient.